I asked Alison to draw 5 different "accessory" images for the Whiff of Joy Party Animals collection which will be release on January 3rd. 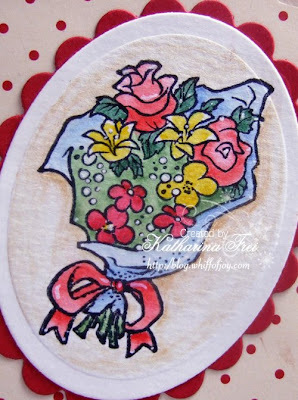 Those "accessories" are quick and easy to colour and perfect to use on cards for all kinds of festivities. Ich habe Alison gebeten 5 verschiedene "Zubehör" Motive für die Whiff of Joy Party Animals Kollection, die am 3. Jänner erscheint, zu zeichnen. Diese sind absolut schnell und einfach zu colorieren und perfekt für alle Karten zu diversen Festivitäten. I did a lot of sewing on this card. All papers are from Stampin' Up and the sentiment is from Aud Design. Ich habe auf dieser Karte recht viel mit der Maschine genäht. Alle Papiere sind von Stampin' Up und der Text ist von Aud Design. I coloured the bunch of flowers with water soluble pens, Twinkling H2Os and glitter pens from Spica. I hope to see you again next year :) and want to wish you and your families all the best for the future!! Take care. Ich habe den Blumenstrauss mit meinen Aquarellstiften von Caran D'Ache, Twinkling H2Os und Glitzerstiften von Spica coloriert. Paper: SU design paper "Washington Apple", SU cardstock "riding hood red"
Gorgeous card, love the stamp. Looking forward to the new releases - not long now! 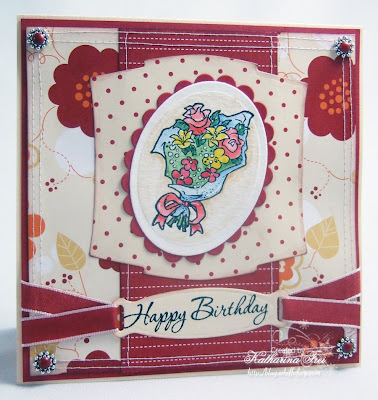 Gorgeous card Katharina! I love it. Lovely stamp, can't wait to see the rest of them! Very pretty!! You are making it hard to resist that die!! Gorgeous colors throughout!! Best wishes for a happy and healthy New Year filled with loads of creativity!! huhu katharina! ich freu mich echt schon so wenn die neue serie online ist *ggg* die mäuse und die anderen tierchen sind ja so goldig!!!! und die karte ist auch süssest. Oh how fun... look forward to all of accessories! I'll wait here all year to see more sneak peaks! Und auch dir und deiner Familie einen guten Beginn 2009. Beautiful card Katharina! And I can't wait to see all of the new stamps! I am definitely counting down the days! Wishing you a happy, healthy, successful, creative, and inky 2009! Wonderful!!! I will have to look for those pens! STILL hoping to purchase Twinkling H20's...my goal for the first few months of 2009! Have a great NYE! Cute card Katharina. Loving the colours and the stitching makes it really stand out.